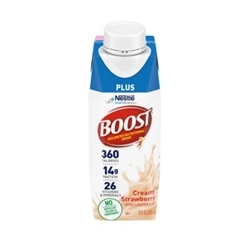 Boost® Plus Complete Nutritional Drink is a delicious beverage that supplies 360 calories, 14 grams high-quality protein, and 26 vitamins and minerals in each 8 ounce serving. Boost Plus is available in three great flavors - Very Vanilla, Rich Chocolate, and Creamy Strawberry. Boost® Plus contains the CalciLockTM blend of essential nutrients to help support bone health. It is a combination of essential nutrients to help build and maintain strong bones. This nutrient blend includes calcium, phosphorus, magnesium, zinc, and vitamins D, C, and K and is designed to help support healthy bone development. Boost® Plus also contains 3 grams of Prebio, a blend of probiotic fibers designed to help promote the growth of beneficial intestinal bacteria and support a healthy digestive system. Boost Plus provides nutritional support for inadequate oral intake, protein-calorie malnutrition, and fluid restriction. NOT FOR PARENTERAL USE. Boost® Plus is packaged in 8 oz Tetra Brik containers. Water, Corn Syrup, Sugar, Vegetable Oil (Canola, High Oleic Sunflower, Corn), Milk Protein Concentrate and less than 1% Calcium Caseinate, Soy Protein Isolate, Sodium Caseinate, Gum Acacia, Fruitooligoaccharides, Potassium Citrate, Inulin (from Chicory), Soy Lecithin, Magnesium Chloride, Calcium Phosphate, Magnesium Phosphate, Salt, Sodium Ascorbate, Choline Bitartrate, Natural and Artificial Flavor, Alpha-Tocopheryl Acetate, Ascorbic Acid, Carrageenan, Potassium Chloride, Ferrous Sulfate, Zinc Sulfate, Vitamin A Palmitate, Niacinamide, Vitamin D3, Calcium Pantothenate, Maganese Sulfate, Copper Sulfate, Pyridoxine Hydrochloride, Thiamine Hydrochloride, Beta Carotene, Riboflavin, Chromium Chloride, Folic Acid, Biotin, Potassium Iodine, Vitamine K1, Sodium Selenite, Sodium Molybdate, Vitamin B12. Great product at an excellent price. Shipped and delivered super fast!